Mick has left the farm after 26 years of loyal service. Previously he had worked at 3 Acres, (Parkhill) Adventure Playground, where he was well-respected and had developed dynamic community facilities. He immediately stamped his mark at the farm by sorting out funding priorities, both new and in cooperation with Camden, and the development of new streamlined policies. His legacy is big! A new farm centre, riding stables, animal barn, fencing et al… the list goes on. It was no mean feat to keep on the task of money finding, but Mick did, with a lot of black coffee, roll ups, and shouting at VDUs, however through all these labours, he managed to maintain his sense of humour and wit, however difficult the situation became. Mick organised a very successful “Save the Farm” campaign when we were threatened with closure due to loss of Local Authority funding (we are likely to have to re visit this in the future), oversaw new management structures, and liaised with Camden in matters farm related. His love of The Arsenal was well-known as was his drinking capabilities, and during such occurrences, topics were always interesting, political, and relevant. Mick is a man who cares about lots of things, but his caring for people will be his lasting legacy here. It was a privilege to work with Mick, and we all at the farm, wish him the best for the future. The Farm would like to thank Mick Magennis, who recently left the organisation after 26 years. Mick’s hard work, commitment and energy helped shape the Farm in many ways. His contribution will be missed. When Mick joined the Farm in 1988, its existence was precarious. Through tenacious lobbying and occasionally hard-headed negotiation, Mick fought countless battles to promote the Farm and help ensure its survival. 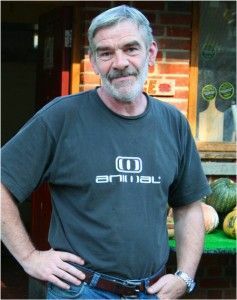 Mick is a skilled campaigner and fundraiser who believes passionately in the ethos of the Farm. Over the years he secured grants and awards from a range of sources, arguing the Farm’s corner and persuading donors to support us. At the 2014 AGM, he spoke about all the good people who have made an impact on the organisation. Mick also spoke of how unique the Farm is, and how the organisation has improved the lives of thousands of people. Mick is an important part of this and should feel proud of his contribution. We wish Mick all the best in future.